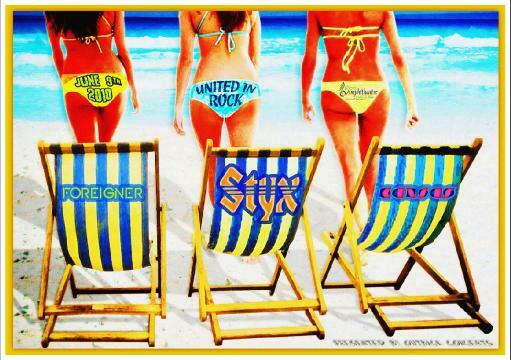 This is a commemorative poster that I designed for the United In Rock Tour, featuring 70's powerhouses Styx, Foreigner and Kansas. The client was real specific with this and I have to credit him with a great throw-back idea. 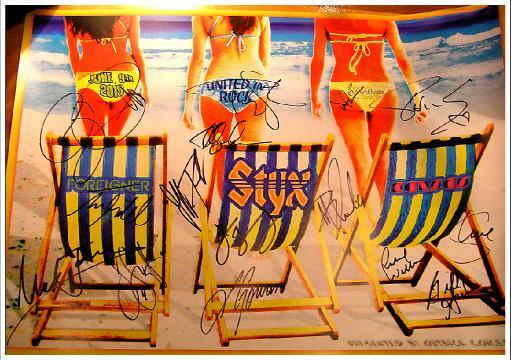 He wanted three beach chairs on the beach, with the band names on the back. In the background, three ladies heading toward the beach with the rest of the show info on their bikini bottoms. This one was harder to make than it probably looks and took about a week to pull off. Most of my time was spent scouring the web for all of these separate elements and the rest of the time was spent making them look like they belonged together. My signed copy is below.